As their name suggests, Indian cobras (Naja naja) can be found across the Indian subcontinent, including Pakistan and Bangladesh, and into Sri Lanka, Bhutan and Nepal. 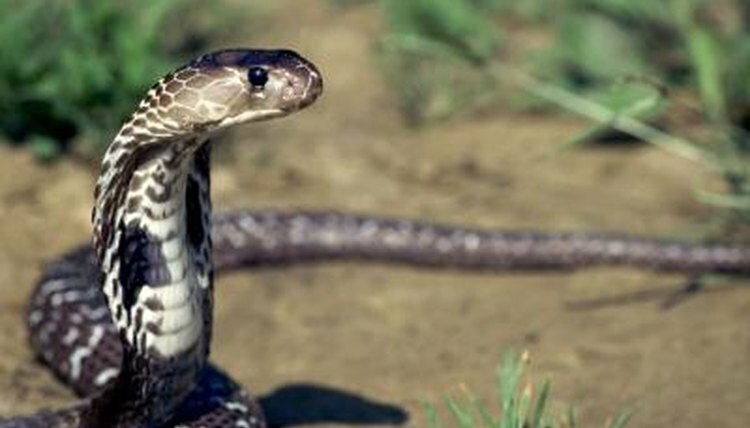 While their colors can vary from black to a pale cream, they have a pattern on the backs of their hoods that resembles eyeglasses, hence their other common name -- spectacled cobra. The main food sources for Indian cobras include lizards, rodents and frogs, though they will also eat birds and birds' eggs. As poisonous snakes, they inject their prey with venom and wait until it becomes paralyzed or dies before attempting to devour it. Like other snakes, they swallow their prey whole, so it's important that their dinner isn't still kicking when they attempt to ingest it. Male and female Indian cobras reproduce sexually, their gametes joining to fertilize the females' eggs. While this is the last the males have to do with their offspring, females of the species defend their eggs devotedly. After they lay their eggs -- usually 12 to 20 -- in the earth or in a hollow tree, they guard them throughout the entirety of their 50- to 60-day incubation period. Mother snakes will only leave their eggs briefly to feed, spending the rest of their time protecting them from potential predators. When Indian cobras feel threatened, they'll adopt their defensive posture. They raise up the front third of their bodies and spread out their hood, by expanding the flexible ribs in their necks. If they deem the danger to be serious, they may also spit venom at their target. They do this by squeezing their venom glands and forcing the poison out from their teeth. Their venom can travel in this way for roughly 6 1/2 feet. Indian cobras are those most commonly used by snake charmers. This is a controversial practice, as snakes are taken from the wild, defanged, devenomed and kept in an unnatural environment, simply for human entertainment. While these cobras might appear to sway to the music, they're actually deaf. Their swaying is simply in response to the motions of the charmers' flutes and the vibrations they can sense from them tapping their feet on the ground.